Enjoy unbeatable panoramic views from this coveted first floor oceanfront unit on the Kaanapali coast. This very special unit is one of only 2 that have a door on your lanai to access the ocean side of the condo directly! You can’t get any closer to the ocean than this resort! Watch gorgeous sunsets over Molokai & Lanai every day from the comfort of your living room. Watch the whales play in the winter and gorgeous sunsets even while cooking in this beautiful kitchen. You will be so comfortable here, you might never want to leave! Step out on the lanai and enjoy the ocean breezes with a cup of coffee or watch the sunsets with a Mai Tai! The condo comes with a fully equipped kitchen, flat screen TV, free WIFI, a King size bed, sleeper sofa and central air conditioning. Your vacation home comes equipped with everything you will need. Just pack your suitcase and that’s it! The resort has coin-operated laundry facilities for your convenience, free parking, and no resort fees. Spend the day at the pool heated pool and Jacuzzi that has an adjoining cabana with brand-new kitchen and lending library for your convenience. 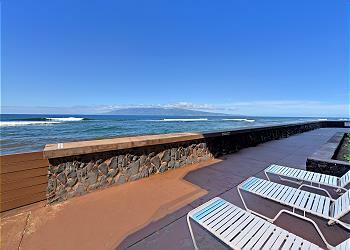 Or choose to spend your day at the world famous Kaanapali beach. Close our your evening by choosing to either dining in your home, BBQ, on property, or perhaps just making a reservation at Dukes! Situated just 5 minutes south of the Kapalua Resort Area, so you are close to some of Maui's best restaurants, shopping, beaches and snorkeling!